Bring a touch of tropical heat to your nails with Emiko, a coral pink polish that will brighten up your look all year round. This summer-in-a-bottle shade is made with an 84% plant-based formula, containing ingredients such as cotton and manioc and enriched with starflower oil and plant keratin. With Emiko, you can be green, glam and coral pink at the same time – this polish has a 10-free formula! What does that mean? Well, quite simply, we use renewable, plant-sourced natural ingredients to make our polishes – made from potato, maize, cotton and manioc – instead of the traditional petrochemical-based alternatives. Prep is key for a perfect manicure. So start with a clean surface (take off old polish and wash and dry hands) and get all your kit and caboodle lined up – no fishing around for your mobile mid-mani—this is a smudge-free area! 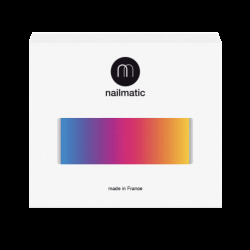 1/ Base coat is the essential first step to protect your nail from staining and provide a smooth surface for your color. 2/ Apply one coat of Emiko in three quick swipes. The first in the middle of the nail, and then one either side, leaving a small gap between the cuticle and the color. It’s super simple thanks to our wide brush! 3/ Add a second coat for a more intense and longer-lasting color. 4/ Thought you were done? Not quite! All that’s left is a quick slick of top coat and you’re ready to go! • The coral-pink of Emiko looks amazing offset with turquoise or teal and it warms up every skin tone from the palest to the darkest. • Don’t paint your nails straight after a hot bath or shower. The water absorbed by the nail will evaporate and this can create bubbling as your polish dries… Better to wait a little bit first.